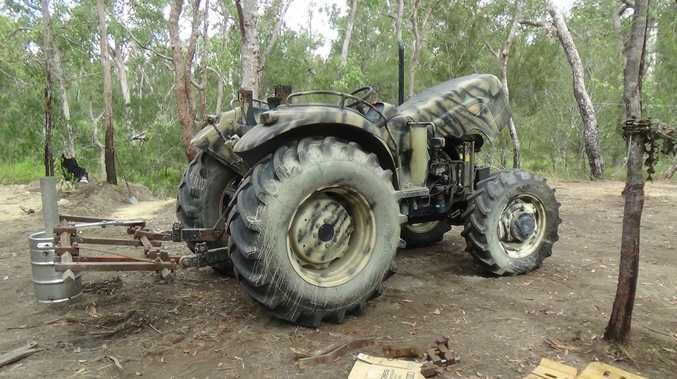 Police seized farm machinery during the north Queensland raids. POLICE have seized 50,000 cannabis seeds and hundreds of thousands of dollars of suspected stolen property as part of a major 16-month operation in the state's north. Investigators executed six search warrants last week in the Townsville, Cairns and Mareeba regions, including one at an isolated property near Mount Garnet on May 11 where police will allege they uncovered approximately 50,000 cannabis seeds. Detective Acting Senior Sergeant Adam Golding said the investigation, codenamed Kilo Enhance, would make a dent in the supply of drugs around Queensland. "This was a major investigation targeting serious organised crime. Drugs have a devastating impact on our communities and these 50,000 cannabis seeds had the potential to supply drug markets across the state. "Investigators from Cairns, Townsville and Mareeba have worked for well over a year as part of Kilo Enhance," Detective Acting Senior Sergeant Golding said. A number of other suspected stolen property worth around $175,000, including tractors and other large farm machinery, a four-wheel drive and multiple weapons, were also recovered from the properties. A 44-year-old Mareeba man, 54-year-old Nome man, 46-year-old Biboohra man, 20-year-old Mooroobool man, 48-year-old Pimlico man, 43-year-old Oak Valley man and 46-year-old Stuart man have been charged with over 100 offences (combined) including over 75 counts of possessing or supplying a dangerous drug, and multiple weapons and property-related offences. Five of the alleged offenders, the 54-year-old Nome man, 46-year-old Biboohra man, 46-year-old Stuart man, 20-year-old Mooroobool man and the 44-year-old from Cannonvale have been refused bail, and all will appear in the Townsville and Mareeba Magistrates Courts in the coming months.